Do you like the new look of the SGA Website? 2006 THON Total: $5,240,385.17 .......... Abington THON Total: $11,238.17 - 9th in the Commonwealth! Visit us at http://abthon.blogspot.com for Abington THON Updates! 2007 Abington THON Total: $11,238.17! THON Meetings: Every Tuesday during Common Break in 112 Woodland. The year culminates in a no-sitting, no-sleeping. 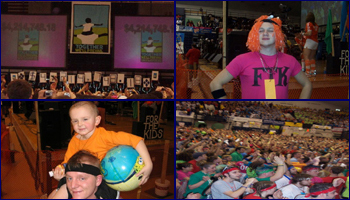 48 hour dance marathon held every February. Over the past 30 years, the students of THON have raised over 30 million dollars that has helped thousands of children and families fight horrific battle of childhood cancer!